Our Public Area and Housekeeping teams have been digging out from the recent snowfall in many parts of the country though we still have a long way to go. As we operate properties in all types of climates nationwide, each season brings different cleaning challenges. When asking about top cleaning challenges during the winter season, many will say snow and salt removal. The more it snows the more salt gets put down to melt the snow and eventually gets tracked into our facilities, potentially damaging our buildings and the surrounding environment. We understand that shoveling and plowing alone cannot always keep the areas safe and that is when salt de-icers come into play. 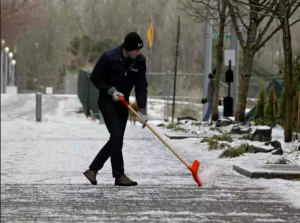 We want to share some cleaning and maintenance tips for these conditions in order to help keep your areas safe and clean, while managing salt being tracked in and around your property. Many times the person who purchases or applies de-icers at our properties is not the same person responsible for cleaning it up inside or out. The key is to use de-icers moderately and to apply what product works best for your situation. There are many types of de-icing salts such as: sodium chloride “rock salt”, calcium chloride, potassium chloride and magnesium chloride, which is far less damaging to concrete, plants and the environment. There is also an opportunity to add sand to provide grit for added traction. Whichever product is being used, there is the challenge to stay ahead of potential damage. Many times salt is applied very close to the entrance. For maximum melting results, it is best to apply the product more sparingly in the highest foot traffic areas. A salt pattern should begin with product applied more heavily away from the entrance and less as you get closer to the entrance. The natural foot traffic spreads it as people come in. Proper application can provide substantial cost savings especially for repairs to interior spaces and corrosion of metal door entrances. It also prevents harm to landscaping with over application of salt too close to vegetation. Proper entrance matting is the next line of defense to keep the “wet” and salt outside. Take a look at the quality and placement of matting at the property entry points. Entrances may have a scraper mat as you enter so guests can release some of the snow followed by a longer wiper mat made of absorbent material that can wick the water and salt off the shoes as they walk. If heavy snow fall is occurring, these absorbent mats need to be changed when they become saturated, so be sure you have enough on hand to make frequent changes to all your outside entrances. Although matting selection and placement is ultimately decided by the facility manager, it is up to all of us to maintain and inspect these often to ensure they remain in good condition. Even with having extra matting in place, salt will still make it inside! Your Public Area team must be ready to remove it in the most effective manner. Entrances should be swept and cleaned often during these times. Vacuuming can work well for salt removal though for safety reasons make sure your team knows not to vacuum damp or wet carpets because it is an electrocution hazard. Also vacuuming up damp salt and soil can damage your equipment. In addition, it is important to train your staff to thoroughly vacuum the carpeted areas surrounding the matting. Even if sufficient matting is placed, there is always more salt and soil deposited as guests are walking off. Vacuuming often is a great start, though you must also have a regular interim carpet cleaning program in place in order to tackle problem areas near entry points. This will help eliminate the salt stains that tend to build up and seem to return even after you extracted the area. We prefer our interim clean be done every couple days during heavy snows and the salting that follows. At times, an extraction method just using hot water with an added neutralizer can provide great results pulling the salt and soil out of the carpets. Although your carpet cleaning generally occurs during off-peak periods, be sure you have a floor blower available to speed the drying time. Once dried, always thoroughly vacuum the area. Because salt and de-icers can wear on marble, one thing to keep in mind during the heavy winter days is to not grind marble. Reserve this process for days where salt will not be tracked into the property. Be sure not to neglect your equipment during this period, as they are working extra hard. You will need to provide extra cleaning care and maintenance. Before you know it, spring will be back again though your work is not complete yet. During any long thaws or once spring approaches, be sure to thoroughly wash down walkways, the base of your building and areas near vegetation to disperse product residue and prevent further damage. Having a good prevention plan in place and keeping the salt outside your facility should provide a safe and clean facility and you will be off to a fresh start for spring.